Std. 10 SSC Board Exam March 2016 English (SL) Paper Answer Key By NIB School, Palanpur. This Answer Key is Prepared By NIB School, Palanpur. 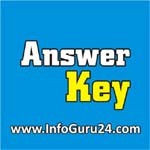 Note: This Answer Key is not Official Answer Key. This Answer Key is Prepared By NIB School, Palanpur.